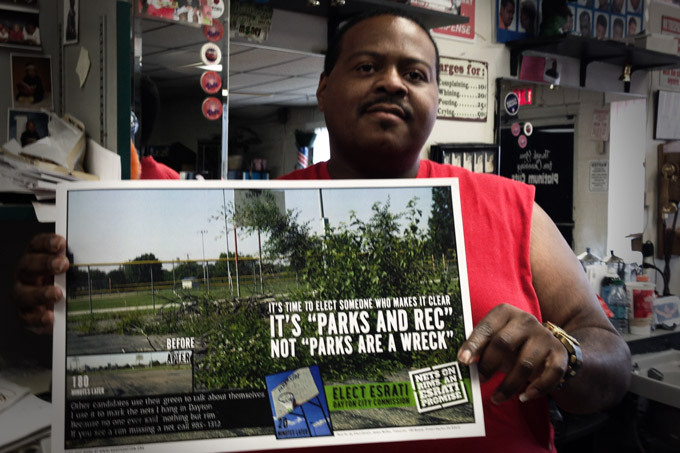 Jermaine Wilkerson of Platinum Cuts wants our parks and recreation back. Platinum Cuts is tucked away at 1011 Miami Chapel St in Dayton, in the heart of Edgemont. Jermaine Wilkerson will take care of your hair- just like he used to take care of Clayton Luckies- who he’s known since he was a kid. Give him a call at 223-2449 to set an appointment or just stop in. Thanks to Jermaine, we’ve got one more net up- and he’s got the poster showing the transformation of Parkside’s courts.